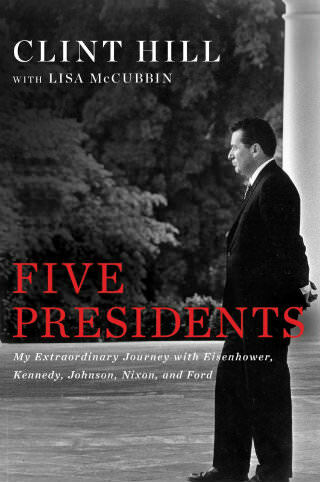 DEARBORN, MI – On Monday, May 16, 2016, The Henry Ford will host New York Times bestselling authors, former Secret Service agent Clint Hill and co-author Lisa McCubbin to discuss their new book, “Five Presidents- My Extraordinary Journey with Eisenhower, Kennedy, Johnson, Nixon, and Ford.” Guests will hear the fascinating firsthand accounts of Mr. Hill’s 17 year career protecting the highest office in the nation. Tickets for the lecture are now on sale and can be purchased by visiting TheHenryFord.org or by calling 313-982-6001. Tickets for An Evening with Former Secret Service Agent Clint Hill start at $75 and include a pre-signed copy of “Five Presidents- My Extraordinary Journey with Eisenhower, Kennedy, Johnson, Nixon and Ford.” VIP tickets are $150 and also include a 5:30 pm reception and reserved seating. Members receive discount pricing on general admission seating. Doors open at 6 pm for general admission with opening remarks at 7 pm. “Five Presidents” provides a unique insider’s perspective, shedding new light on the character and personality of the five men Mr. Hill protected, revealing their humanity in the face of grave decisions. Hill walked alongside Presidents Dwight D. Eisenhower, John F. Kennedy, Lyndon B. Johnson, Richard M. Nixon, and Gerald R. Ford, seeing them through long, tumultuous times—the Cold War; the Cuban Missile Crisis; the assassinations of John F. Kennedy, Martin Luther King, Jr., and Robert F. Kennedy; the Vietnam War; Watergate; and the resignations of Spiro Agnew and Richard M. Nixon. Clint Hill will forever be remembered as the courageous Secret Service Agent who leapt onto the back of the presidential limousine in the midst of the assassination of President John F. Kennedy in Dallas, on November 22, 1963. His primary responsibility was the protection of First Lady Jacqueline Kennedy, and for his actions that day, Hill received the nation’s highest civilian award for bravery. Hill rose through the ranks of the Secret Service to become the Assistant Director, responsible for all protective forces, having served five administrations—Eisenhower, Kennedy, Johnson, Nixon and Ford. He remains in contact with the current U.S. Secret Service and is actively involved in training activities at the Federal Law Enforcement Training Center. Mr. Hill’s co-author Lisa McCubbin is an award-winning journalist who has been a television news anchor and reporter for NBC, ABC, and CBS; hosted her own talk radio show; and spent more than five years in the Middle East as a freelance writer. McCubbin has collaborated with Clint Hill to write “Mrs. Kennedy and Me,” a memoir of the four years he spent with Jacqueline Kennedy and “Five Days in November,” the riveting moment-by-moment account of the days surrounding the assassination, alongside 170 remarkable photographs. The Henry Ford in Dearborn, Michigan is an internationally-recognized history destination that explores the American experience of innovation, resourcefulness and ingenuity that helped shape America. A national historic landmark with an unparalleled Archive of American Innovation, The Henry Ford is a force for sparking curiosity and inspiring tomorrow’s innovators. More than 1.7 million visitors annually experience its five attractions: Henry Ford Museum, Greenfield Village, The Ford Rouge Factory Tour, The Benson Ford Research Center and The Henry Ford Giant Screen Experience. A continually expanding array of content available online provides anytime, anywhere access. The Henry Ford is also home to Henry Ford Academy, a public charter high school which educates over 500 students a year on the institution’s campus. In 2014, The Henry Ford premiered its first-ever national television series, The Henry Ford’s Innovation Nation, showcasing present-day change-makers and The Henry Ford’s artifacts and unique visitor experiences. Hosted by news correspondent and humorist, Mo Rocca, this Emmy®-winning weekly half-hour show airs Saturday mornings on CBS.